Are you nervous? 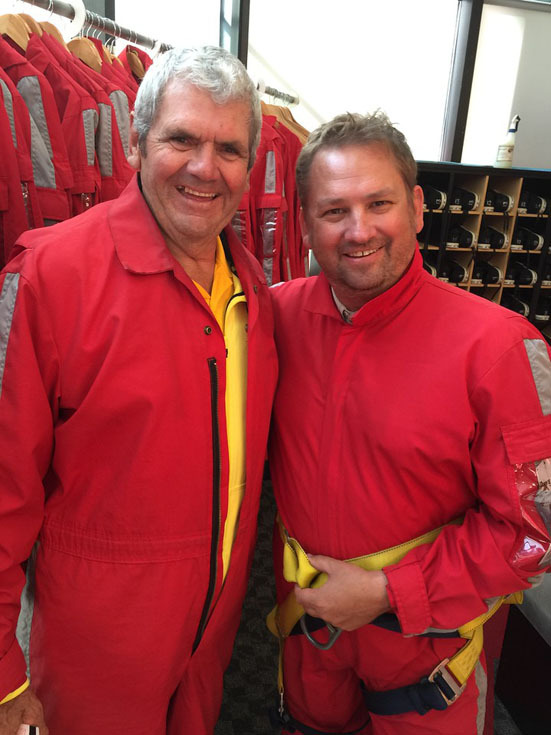 “No, it's just a walk around the block.” That was the reply my dad gave me when I asked him if he was nervous as we prepared to go on the world's highest skywalk. 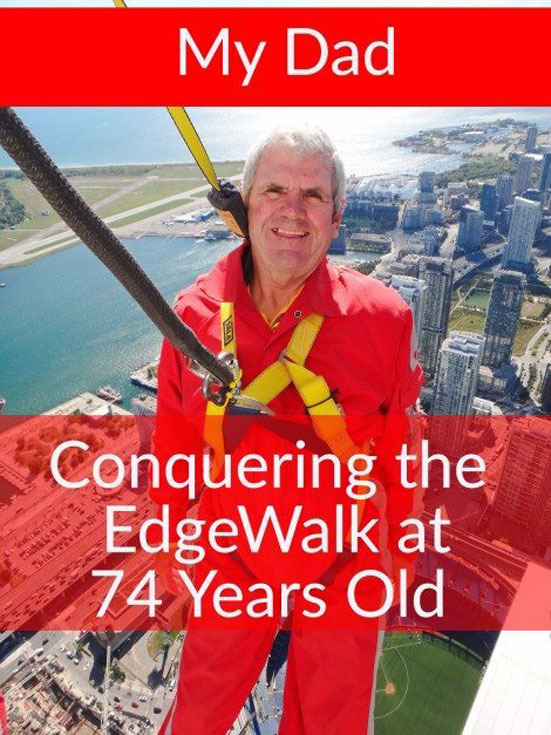 The CN Tower Edgewalk, may be the highest hands-free circular skywalk in the world, but it's more than just a walk; It's Toronto's most extreme attraction! We met at the base of the world's third highest tower for our safety briefing. My mom was a nervous wreck thinking about all of us going outside up in the air, but she was able to watch us get ready from behind the glass wall. And once we were outside, there are cameras that broadcast the skywalk to videos in the CN Tower Observation deck. After signing our waivers and watching the video of the previous group, we left mom and started to suit up for our adventure ahead. 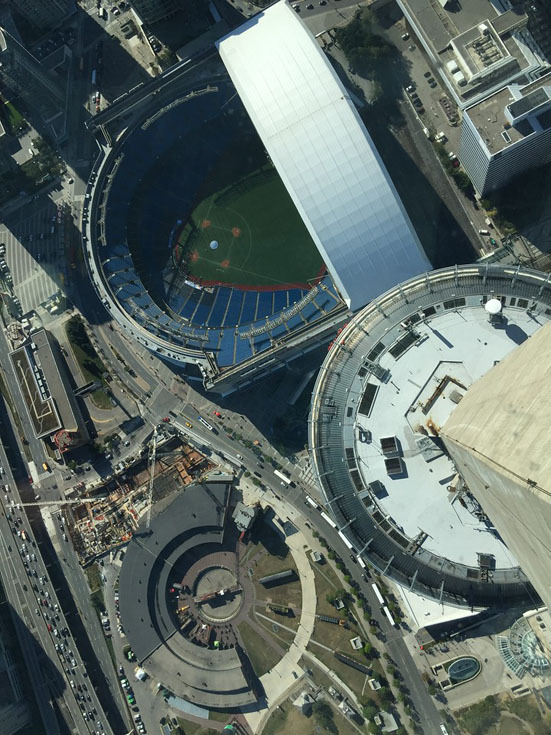 Read about the Calgary Tower Canada's other tall tower. We all changed into our red jumpsuits and took off anythings that could possibly fall off our bodies. There's no jewelry (even wedding rings need to be taped) no hairpins or combs and no cameras allowed. 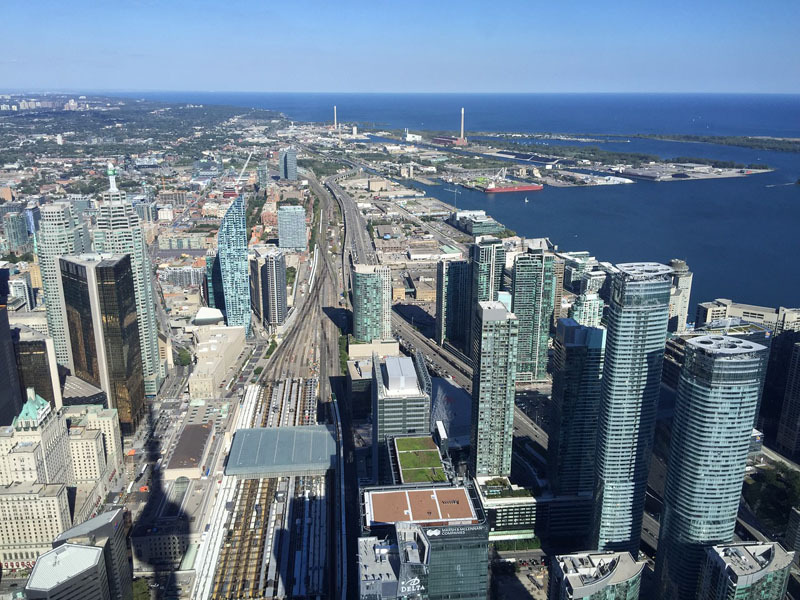 Your guide wears a camera on his helmet and shoots photos and videos of the adventure so you are free to enjoy each and every moment of your time over Toronto. 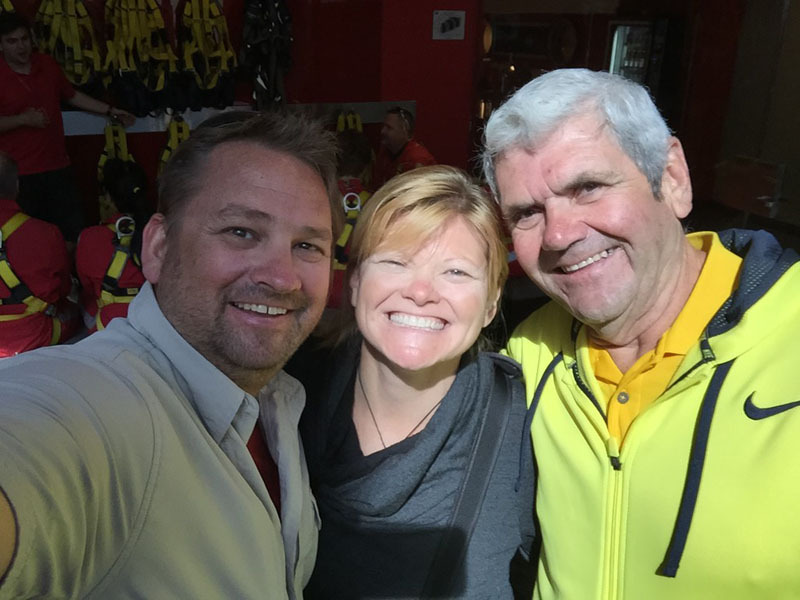 After checking to make sure we hadn't been drinking, doing a final check of our harnesses and signing our lives away on the waiver form, we were on the elevator climbing to the 116 floor of the 147 story structure. I felt nervous of how I'd react standing on the edge of the steel platform looking down on the city below. I'd seen photographs of people leaning over the edge and I wasn't sure if I'd like it or not. Dad on the other hand, was cool as a cucumber. Dave had broken his pinky toe that morning (I'm not joking!) and was worried about doing the walk, but he sucked up the pain and was thrilled that he didn't drop out. It's an adventure of a lifetime that you don't want to miss! We all walked out single file and our guide made Dave the anchor man at the back of the pack. Walking out was no problem at all, and we all had a good hoot and holler once we were standing in a line looking over Lake Ontario. Everything was fine as we got used to settling into our harnesses and feeling the wind in our faces. But I'm not going to lie, when we had to do our first nerve test, I felt a bit shaky. But the adventure around the 360 degree walk builds slowly and you are tested to try different maneuvers. The toes over the edge eventually moves to a lean over the edge and a pop up onto your tip toes. Soon you are leaning backwards and waving your hands in the air and feeling completely confident at you dangle 356 m / 1,168 ft in the air. The 30 minutes outside is well worth the $195 fee. The time outside is the perfect amount to view the city below and it's enough time to settle your nerves so that you can really enjoy yourself high up in the sky. I wasn't wishing for more or less time. As Goldie Locks would say, “it was just right. As we all stepped out of the elevator, we felt like heroes as the crowd below said to us, “Did you do that?” Yep, we're a bunch of brave souls facing our fears dangling over the edge of the world's highest skywalk. The fun didn't stop there either. 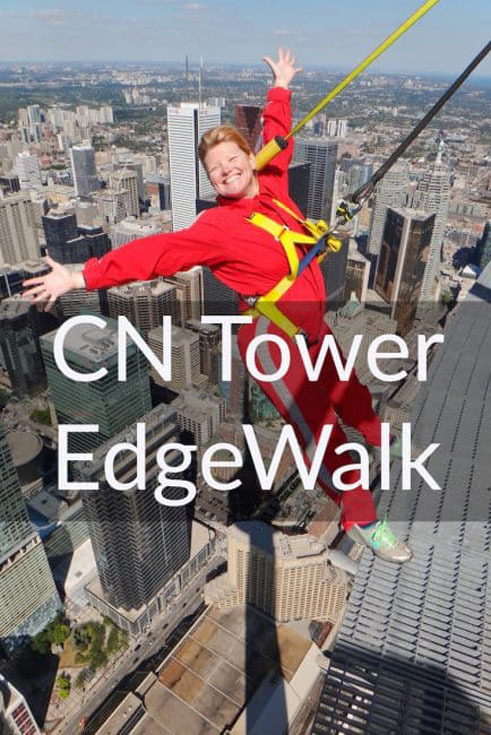 With your EdgeWalk pass you also given access to the Lookout, Glass Floor, SkyPod and other attractions. Book yourself a meal at the revolving restaurant, and you could spend the entire day at what was once the tallest structure in the entire world while having an adventure that you can brag to your friends about for years to come. 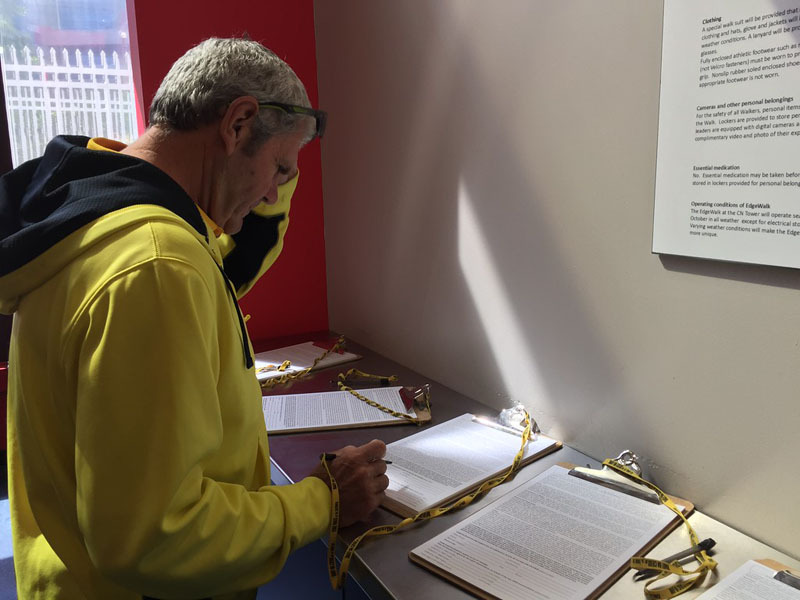 Congratulations to my dad, Jim Corbeil for surviving his first adventure with ThePlanetD. He made it look so easy and is ready for more. He told us afterwards, he's ready for skydiving! The EdgeWalk goes all year long (weather permitting) and should be booked at least a couple of days in advance. The cost is $195 CAD for the 90 minute experience. (30 minutes is spent outside) The cost also includes access to the Observation Deck, SkyPod, Glass Floor and attractions. 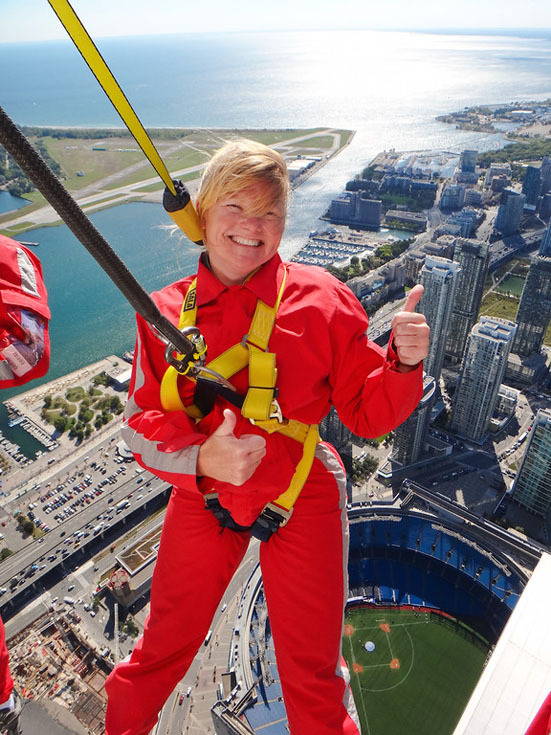 For more information visit the CN Tower for Details. 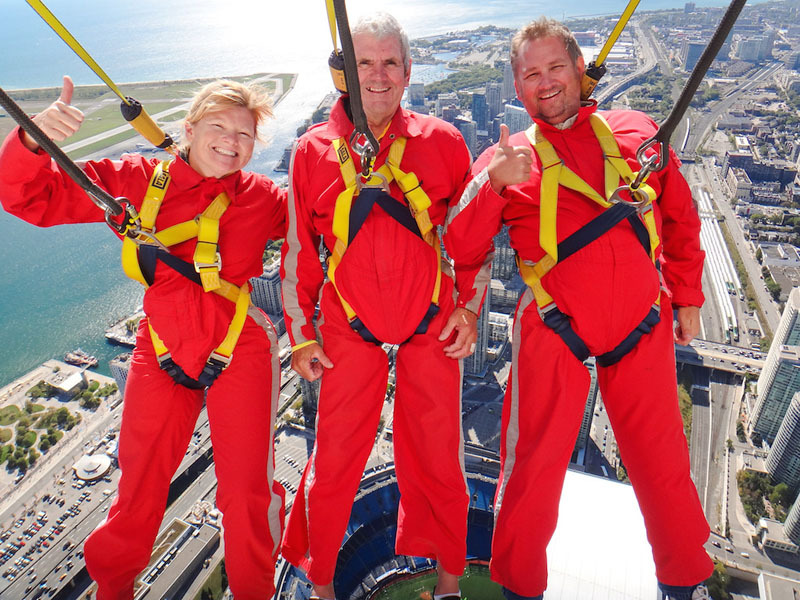 10 Responses to "CN Tower Edgewalk – Taking on The World’s Highest Sky Walk"
What a grand adventurous experience you had with your parents! While reading your well written post, I could feel myself actually doing the same. The video and snaps are spellbinding. Now my adventurous hormone is tempting me to experience this first hand. I intend to return in Banff and explore more nature. Beautiful photos, congrats. This post is very amazing & adventuring. 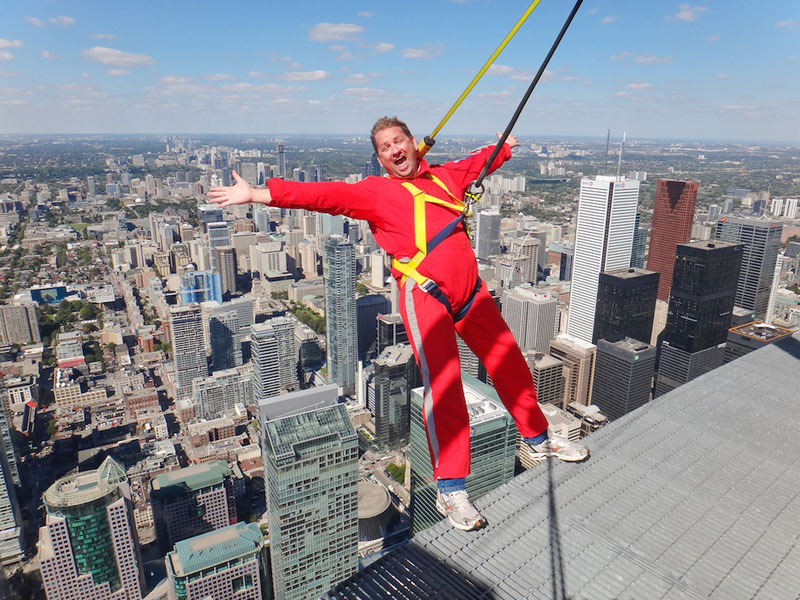 Edge walk on CN Tower OMG!! It is so freaking..!! Thanks! It was a little freaky, but once you settled in, it was awesome. ! You can also try Sidu River Bridge, really worth trying! Oh my gosh that’s pretty scary walking on the edge and yet it looks awesome! 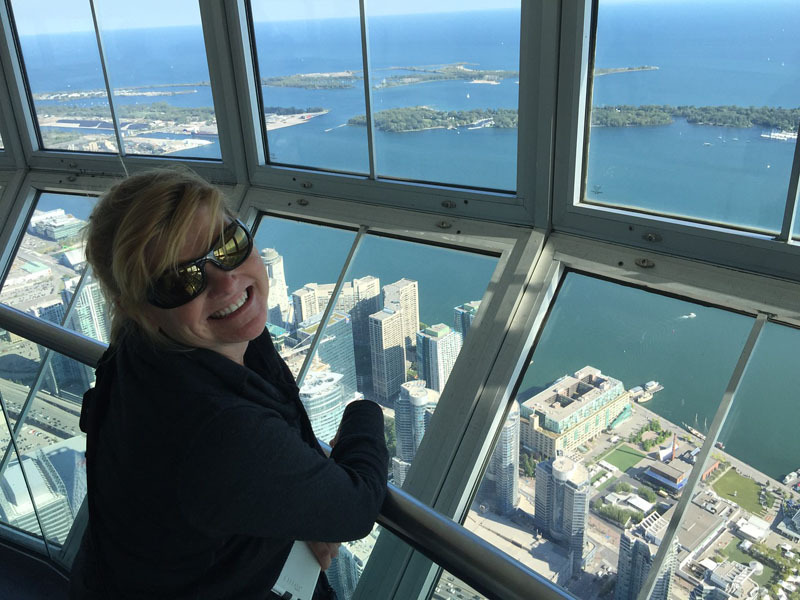 I’ve been up the CN Tower a few times, and on a clear day the views are spectacular. But you couldn’t pay me to put on an orange jumpsuits and hang off it! 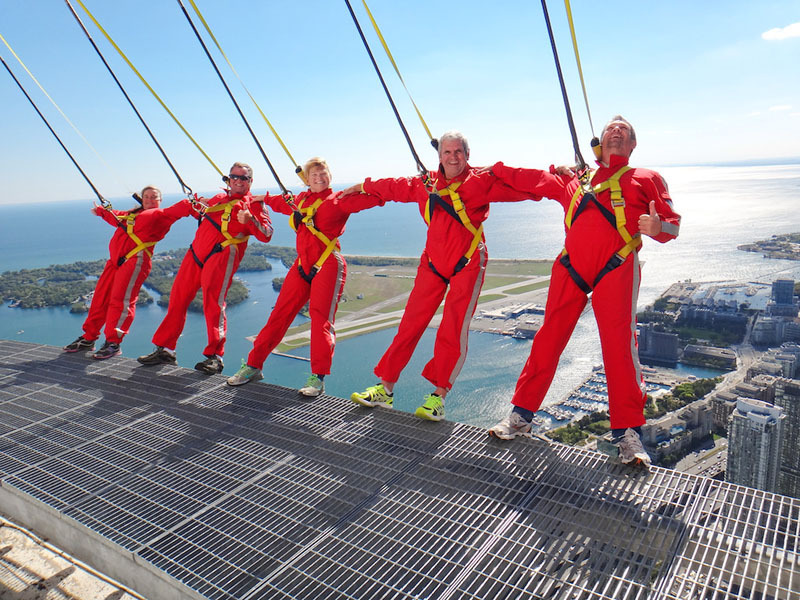 I did this in Auckland at the Sky Tower and it was SO fun! But yeah, actually a lot scarier than I thought it would be! Our guide had us walking backwards at one point, and my knees were definitely wobbly!